Satguru Ram Singh ji is one of the greatest social reformers, a spiritual teacher and national leader. He was a saint of very high order, a spiritual guide who showed the way of peace in the groping humanity. The great Satguru Ram Singh Ji born at Bhaini, a small village in District Ludhiana (Punjab) in 1815. Sardar Jassa Singh was his father, who was carpenter by profession and Ramgarhia (Matharoo) by cast. Satguru Ji got his early education at Bhaini Sahib in Gurmukhi and Gurbani. He joined Khalsa army and served for several years under Kanwar Naunihal Singh (grandson of Maharaja Ranjit Singh Ji). While serving in the army he came across Baba Balak Singh Ji. The word and teaching of Baba Balak Singh Ji sank deep into his mind. One day Satguru Ram Singh Ji said goodbye to his job and started his spiritual life. The year 1857 was not an ordinary year. It was the year of revolt, struggle and war. Satguru Ram Singh Ji was not a silent spectator. 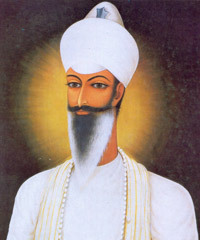 He formed "Sant Khalsa”, which later developed into great historical Kuka movements. He therefore issued a special code of discipline for his followers. All followers of satguru are distinguished by the white dress, straight and pressed turban and a woolen rosary. Satguru Maharaj preached the message far and wide which exercised a check on the western impact. In 1872 after the MALERKOTLA incident whole Kuka movement was outlawed, Bhaini sahib was surrounded. Satguru Ji was taken into custody and was deported first to Alahabad and then to Burma, where he remained as state prisoner Even in exile Satguru ji continued to have contact with his followers and exchange messages fore-casting the "British Raj was now on its last legs”.